Can a 17.3-inch screen lift this Toshiba above the competition? The big screen might stand out, but little else about this machine does. The traditional desktop replacement laptop has lost prominence over the last few years thanks to the growth in gaming notebooks and mobile workstations, but there's still plenty to like about larger laptops such as the Toshiba Satellite L70-B-11C. For starters, it costs £599, or $935 in the States (about AU$1,011) – half the price, or less, of dedicated gaming or workstation notebooks with 17.3-inch screens. 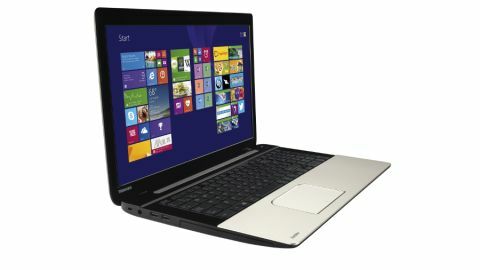 It also means you're getting more for your money when compared to rival machines: the Toshiba Satellite S50D-A-10G is cheaper but it's got a 15.6-inch screen and AMD internals, while the Lenovo Flex 2 15 is smaller, although it benefits from a 300-degree hinged mechanism. The price puts this machine firmly in mid-range territory – and its design does, too. The Satellite's exterior is made from plastic, and much of the material feels hollow and cheap rather than solid and reassuring. Its looks aren't much cop, either: the champagne-tinted metallic plastic is coated with a subtle lined pattern. It's a better look than the plain metallic colour of the Satellite S50D, but it still can't match the dark, brushed finish used on the Lenovo. There's a rattle from the wrist-rest, and the middle of the screen's casing depresses easily when it's pushed. Pressing the base panel saw the keyboard's shape distort. Such mediocre build quality means that we'd only travel with the L70 if it was protected by a case or sleeve. Despite the lack of strength, the L70 still weighs 5.9lb (2.7kg) and is 1.33-inch (34mm) thick, so you'll notice when it's slung inside a bag. Both rival machines, with their 15.6-inch screens, are smaller. It's not too satisfying to use the Toshiba's keyboard or trackpad, either. The keyboard is large enough, and its layout is fine, but the L70's typing action is hampered by a familiar Toshiba trait: a lack of key movement. The keys are light and fast, so we were able to work on the L70, but pricier machines will have better hardware. The trackpad is smooth and accurate, but its buttons disappoint. When pressed towards the centre, they're not snappy enough, but in each corner the buttons require more pressure – and there's little feedback to indicate that they've been prodded. The Satellite's internals don't stray from the mid-range notebook blueprint. The Core i5-4200U processor is the weakest low-part chip in the Core i5 range thanks to clock and Turbo speeds of 1.6Ghz and 2.6GHz. The Toshiba S50D's AMD APU beats both of those figures, at least on paper, and the Lenovo deploys a Core i5-4210U – the next step up in the range. The processor includes the underwhelming HD Graphics 4400 integrated core, and there's 8GB of RAM, a DVD writer and a 1TB hard disk. Connectivity is fine: dual-band 802.11ac Wi-Fi is fast becoming the standard on all but the cheapest laptops, and there's Bluetooth 4.0 and Gigabit Ethernet. Around the edges you'll find a decent laptop load-out. Pairs of USB 3.0 and USB 2.0 ports mean there's one more connector than most notebooks offer, and there's an SDXC card reader, two 3.5mm jacks and both HDMI and D-SUB video outputs.